Here we are in the historical centre of Olinda, a pretty UNESCO Heritage Site just north of Recife in north east Brazil. We were low on cash and needed a cash machine (ATM). Most of the small bars and eateries in Olinda only take cash and most are no more than someone selling beer from their lounge room window. We walked up to the top of the hill in Olinda, a steep climb that was strenuous in the heat and high humidity. Still, it not as hard as the walk to our apartment in Lake Como. The one cash machine there by Itau bank didn’t work with our card. Zorba refused to the use the generic cash machine located inside a small dodgy looking convenience store, so that meant a walk to the commercial area of Olinda. Heat and humidity – two elements that don’t make a walk pleasant. The crappy broken pavement and the heavy traffic did nothing to improve the situation. We must’ve walked for 45 minutes or more before reaching a cash machine. Another Itau, and another failed attempt. Another 15 minutes walking, dodging potholes in the blaring heat, and we reached a Bank of Brasil, but being Saturday, it was closed and there were no cash machines. Sigh. I was hot and thirsty, and getting grumpy. Ten more minutes trudging, sweating, and we reached another Itau bank that had six cash machines inside the foyer. The first cash machine displayed the same error message we’d seen before. The second cash machine did the same thing. This was not looking good. My patience was very rapidly running out. It didn’t make sense, Itau sponsor the World Cup and are Brasil’s major bank. Why wasn’t our card working? In a huff, I snatched the card from Zorba, who up until this point had been the one trying to withdraw cash, I inserted the card in and upon the machine’s instruction I removed the card and did so with downward pressure. Hurrah! No error message. I had the magic touch. We withdrew some cash and left. The colour of the ocean from a distance was a lovely aqua, however up close it’s evident that it’s polluted. 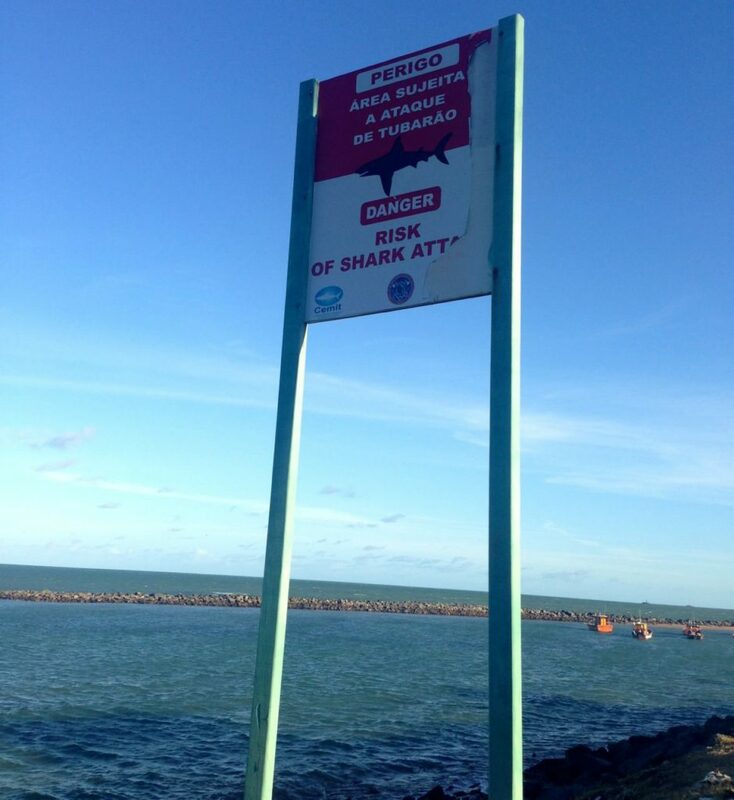 That, and the signs warning of shark attacks quashed any thought of jumping in to cool off. There is no beach to speak of either, just some patches of hard sand in between retaining rock walls. The thought of the long walk back was too much for me to bear, so I declared a beer stop. Zorba didn’t disagree and followed me as I lead us to a parallel main road along the coast. 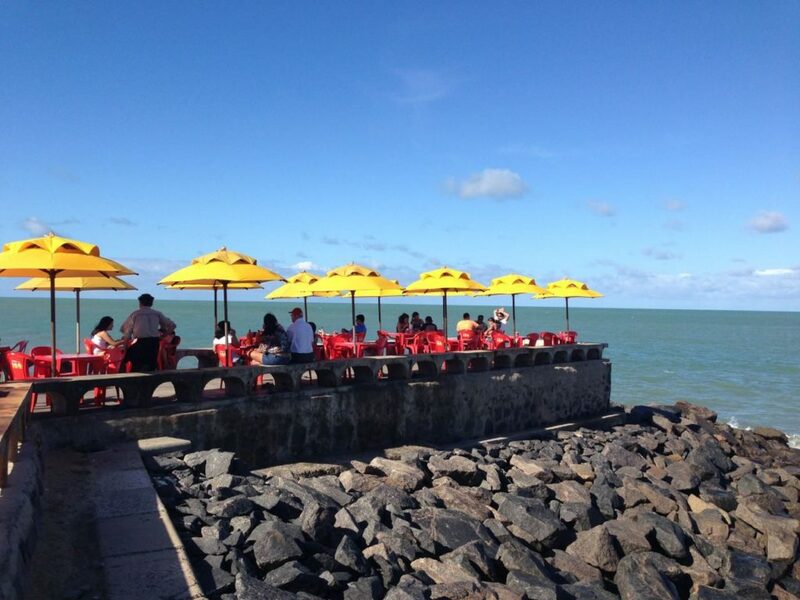 Along this road were several large looking Brazilian restaurants, some with outdoor tables, chairs and umbrellas set up across the road, on the ocean side, along some groins that jut out to sea. 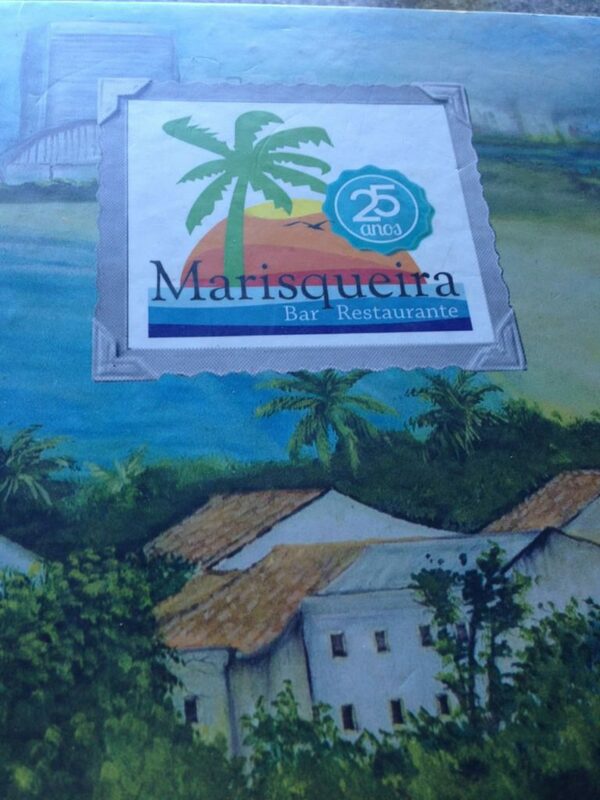 After walking past the first two restaurants, we stopped at the third, a place called Masiqueira. It was packed full Brazilians enjoying a late lunch, and by the looks of things, lots to drink too. The restaurant setting was fairly basic, but that didn’t seem to hinder it’s popularity. It was 3.30pm, we’d not had lunch and our dinner reservation wasn’t until 8pm, so we decided to have something small to eat. The large menu was in Portuguese, but helpfully, it had some pictures. It must’ve taken fifteen minutes to try and decipher the menu and decide what to have, and in the end I just pointed at pictures – the waiters didn’t speak English. I chose a small cup of caldinho feijouda, a blackbean soup (3.50 Real / A$1.50), some maxaceira empanada (9.50 Real / A$5), which were like polenta chips but made with manioc (like a white sweet potato), and four steamed crabs (15 Real / A$7.50). The crabs came with a board and bashing stick to crack the shell. They were very small and for me, too fiddly to be enjoyable. The small serve of bean soup contained a boiled quail egg. It was perfectly seasoned and my favourite thing on the table. We loved this little find. Dishes were cheap, there was a view of the ocean, it was full of locals and the food was good. If we weren’t looking for a bank, we would have never have stumbled onto that place. An unexpected winner. Have you had an unexpected and fabulous food experience on your travels?